You cut Giggs, he bleeds Red. You cut Bebe and Obertan, they just bleed red. And take off the big headphones, you little arse – that’s exactly what fans hate to see from their idols. At least look like you give one single toss. Not fit to wear the puffer jacket. Utter twats. Personifies this generation of players. Oh my GOD they’re wearing headphones. Stop being such conservative British tossers, give them a break. Haydos, they’re utter twats why exactly? 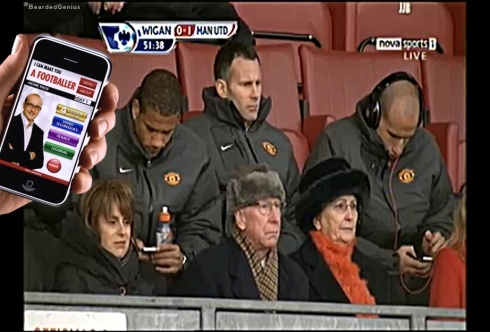 Because when this photo was taken they happened to be looking down, while Giggs was looking up? Or because Obertan is listening to music on slightly large headphones? They may well be twats, I don’t know either of them personally, but there’s nothing wrong with this picture. yeah i fully agree with @arshavagina … im a huge man-utd fan, but give the guys a break. 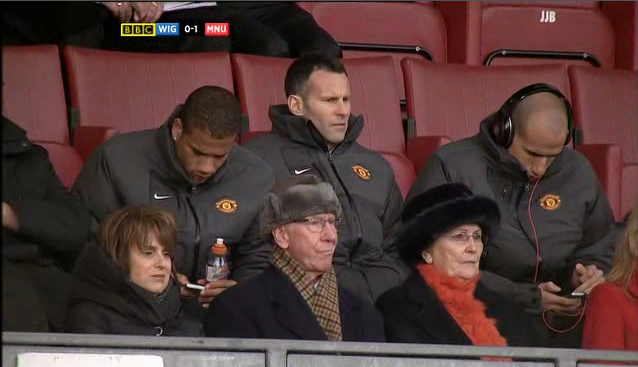 theyre there watching the game, changing a song on an ipod take about 5 seconds to do, not 90 minutes. that said, these 2 need to start putting in more effort on the pitch, but fergie saw the potential and bought them for a reason. evra and ronaldo were shocking in their first season, and coming to the fastest and most physical league in the world aint easy! is it not the fact that they’re actually listening to music rather than watching the football and paying attention? Giggs face makes this photo. A nice laugh to start off the day. He could of been listening to 5 live for all we know. @Ruperto Why Are You Typing Like This? Anyway, this could have been before kick off, half time. Hence the empty seats around them.